Mackenzie participated in this year’s Alabama Eye Screening Program at her school. The results indicated that she was nearsighted. Mackenzie has always been a very active little girl who enjoys playing outside. She has always done fairly well in school, so there was no reason to suspect she had any vision problems. However, when Mackenzie was taken to see the eye doctor, the screening results were confirmed. The doctor said her vision problem was not severe at that time, but if left untreated it could become worse. 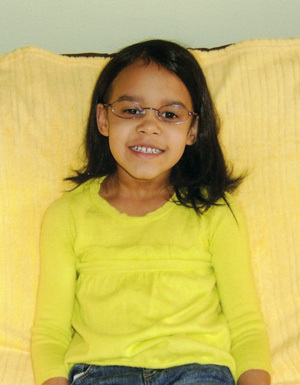 Glasses were prescribed for Mackenzie to wear full-time every day. Mackenzie’s teacher also commented that since getting her glasses, Mackenzie is staying on task and completing her work in a timely manner. She attributes this to Mackenzie now being able to clearly see the board and other things at a distance.